The Lapeer City Superheroes, along with the City of Lapeer Youth Council are sponsoring a clean-up event. If you would like to volunteer, please click here for information and to download a volunteer application. Return the completed application to the City Manager's office for processing. Help be a part of beautifying the City of Lapeer! Post photos of yourself cleaning up the City using the hashtag #LapeerTrashTag. The Annual Spring Clean Up has been scheduled for May 6, 2019. All items to be picked up must be placed at the curbside before 7:00 a.m. on Monday, May 6, 2019. Click here for more information. Sealed bids are being accepted for custodial services for various City of Lapeer facilities. Click here for more information. Click here for information about 2020 Census Jobs. DTE Energy will be performing tree trimming in 2019 in our community to help improve electric reliability. Click on the links below to read about the main areas they are expected to be worked in. During the tree trimming process, DTE will reach out to their customers. Initially, customers will receive a phone call and letter from DTE explaining they will be in the area. The first step is to plan the work. If the costumer is not at home when their property is being evaluated ("planning the work"), DTE will leave a door hanger with contact information for the property owner. Additional information may be found on DTE's website at www.dteenergy.com/treecare. Leaf pick up begins November 1st. Please click on the link for more information. Starting Saturday, October 6, 2018, recyclable material will again be accepted the first and third Saturday of each month. 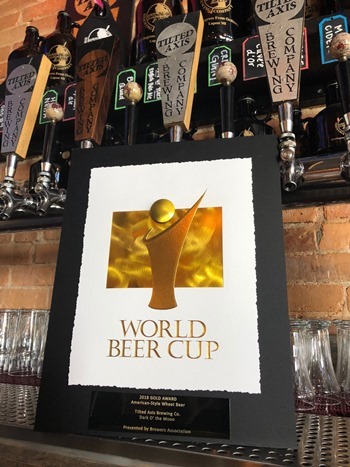 Congratulations to Tilted Axis Brewing Company for wining GOLD for its Dark O' The Moon in the American-Style Wheat Beer Category at the May 3, 2018 World Beer Cup in Nashville, TN. Visit Tilted Axis Brewing Company website: click here. CABLE COMPLAINT. CONTACT MICHIGAN PUBLIC SERVICE COMMISSION. If you are having issues with the cable company, you need to contact the Michigan Public Service Commission as the City of Lapeer has no authority over any cable company. View Michigan Public Service Commission letter here. Are you struggling with suicide thoughts, bullying, substance abuse? Lapeer County Community Mental Health offers a variety of services to help in a time of need. CITY OF LAPEER TITLE VI NON-DISCRIMINATION PLAN. Click here to go to the City of Lapeer's transparency information to view a copy of the plan.